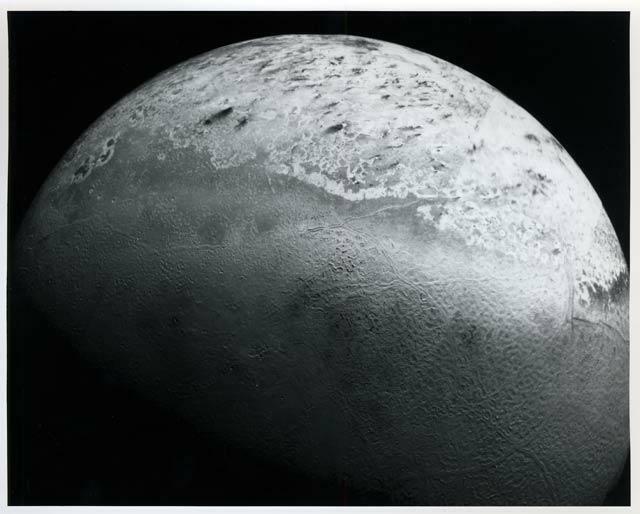 This photomosaic of Triton, Neptune's largest moon, was assembled from fourteen individual frames to show the great variety of its surface features. At the bottom of the image are remnants of the south polar cap, which contain dark streaks generally aligned toward the northeast. Even though these features are darker than others on Triton, they reflect nearly ten times as much light as the surface of the Earth?s moon. The region that scientists have informally dubbed the 'cantaloupe' terrain, as a result of its small dimples with upraised rims and shallow central depressions, is visible north of the cap, in the western half of the disk. Long fractures that have opened and allowed some icy material to ooze up and form a central ridge crisscross the region and extend into parts of the polar cap region. Toward the south this terrain is covered with a light layer of frost.